How much does a complete paint job cost for a vehicle? This can be a loaded question because there are so many variables that go into a complete paint job. Do you want a color change, is there bodywork that needs to be completed, is this the 2nd or 3rd paint job on the vehicle, is this a 3 stage color, is a warranty included etc? All these questions can determine how much a customer will pay. Most reputable shops will give a lifetime warranty or lifetime guarantee on all the work they do for as long as the customer owns the vehicle. These Auto Body shops are able to give this type of warranty because of the products and prep work they do before painting the vehicle. There are many different grades of paints and clears that can range from $50 a gallon to more than $800. There could also be body damage that needs to be repaired before the vehicle is repainted. The variables listed above will determine the cost of having your vehicle repainted. If a customer is trying to have a color change on their vehicle this will be even more expensive because of the labor involved removing, and disassemble the vehicle to make it look like it was sprayed in the factory when it was built. 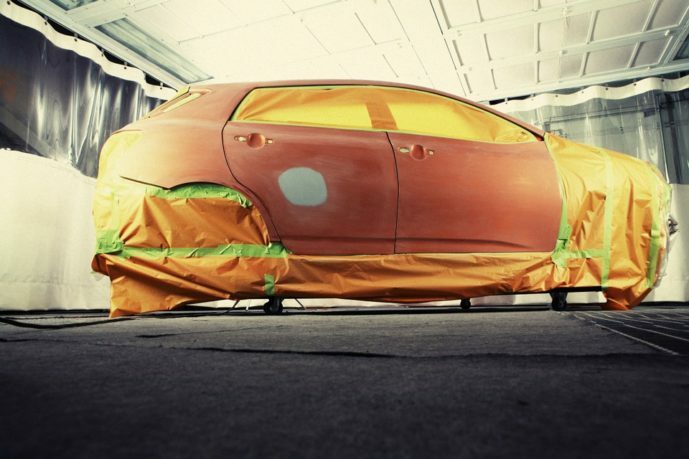 Depending on the auto body shop, a standard complete paint job quote will include de-trimming the vehicle before it is sprayed. Most all reputable shops will de-trim your vehicle, remove moldings, glass etc to make sure the job is done right. Some of the cheaper paint shops will NOT de-trim and will just mask over moldings, around glass and spray the vehicle. This can cause all kinds of issues because the areas around the moldings or windows are not sanded properly and your paint can start to peel or crack days, weeks, or months after it is repainted. Using cheaper clears and paints will also fade, crack, and peel much quicker than higher end products. Prep work makes up about 80% of the time spent when repainting a vehicle. Nice paint jobs don’t just have quality paint and clear products, it’s the work done before and after the paint is sprayed that makes the vehicle look factory or sometimes better than factory. Color sanding and polishing can also be major factor in making the paint job look perfect. At the end of the day it all boils down to budget. If you have a smaller budget and plan on selling the vehicle quickly you might take it to a cheaper paint shop. If you plan on keeping the vehicle and it has sentimental value you might look into a more expensive paint job. Just remember you normally get what you pay for. We recommend getting a few estimates from different auto body shops to see how the price points compare for what you are asking for.